Make yourself at home in one of the 28 guestrooms. Complimentary wireless Internet access keeps you connected, and cable programming is available for your entertainment. Private bathrooms with bathtubs or showers feature complimentary toiletries and hair dryers. Conveniences include phones, and housekeeping is provided daily. With a stay at Hotel Claris & Residence Abacta, you'll be centrally located in Prague, a 4-minute drive from Czech National Museum and 7 minutes from Wenceslas Square. 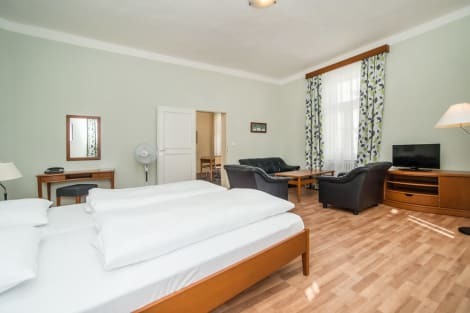 This hotel is 1.4 mi (2.3 km) from Prague Dancing House and 2.3 mi (3.7 km) from Astronomical Clock. Make yourself at home in one of the 9 guestrooms, featuring kitchens with refrigerators and microwaves. Flat-screen televisions with satellite programming provide entertainment, while complimentary wireless Internet access keeps you connected. Conveniences include safes and coffee/tea makers, and housekeeping is provided on request.